Although it’s certainly a bit pricey, the Ultroner / Asmodus Luna Squonker Box Mod is a beautifully design device that we thought was worth sharing. 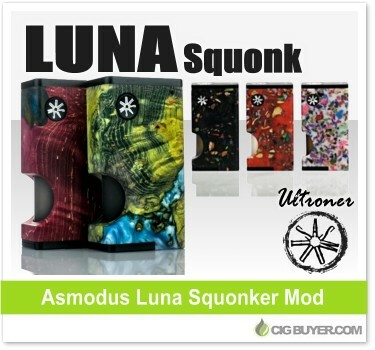 Manufactured by Asmodus in collaboration with Ultroner, the Luna Squonk Mod has a quality 6063 aluminum chassis with a stabilized wood body; providing each piece with a unique and one-of-a-kind look. Powered by a single 18650 battery, the Luna Squonker Mod is unregulated, but features a UL-80-JX Chipset to provide a suite of safety features and up to 80W of output with resistance range of 0.1 to 3 ohm. It features a 7ml squonker bottle, magnetic squonk bottle door and a threaded (tool-less) battery cover.